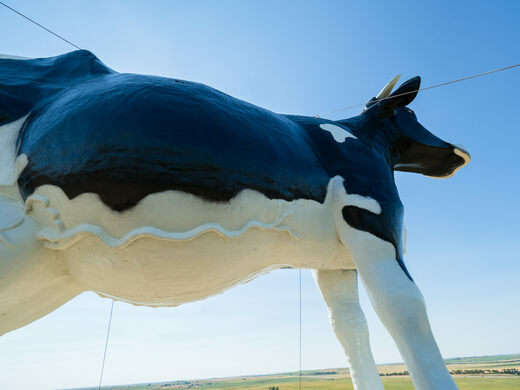 Perched atop the only hill visible for miles is the pride of New Salem, North Dakota: Sue, the world’s largest Holstein cow sculpture. 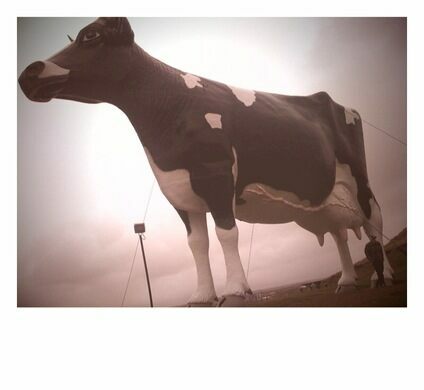 Built by the local Lions Club in 1974 for a mere $40,000, Sue is one town’s tribute to its dairy-farming legacy. Six tons of fiberglass form Sue’s 38-foot high, 50-foot long, disturbingly anatomically-correct body. 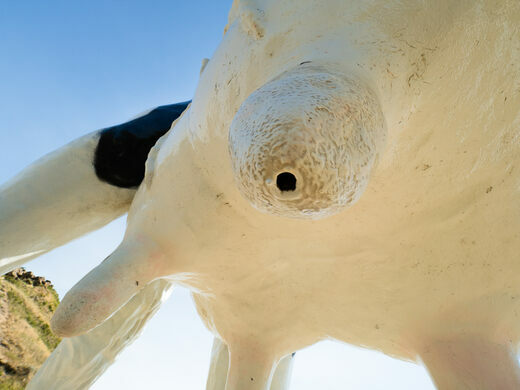 Grown men stand beneath her udders with confidence, knowing that their heads will not bonk a teat. Mothers envy her gentle, bucolic gaze while their children wonder at the pink-painted veins running along Sue’s underside. 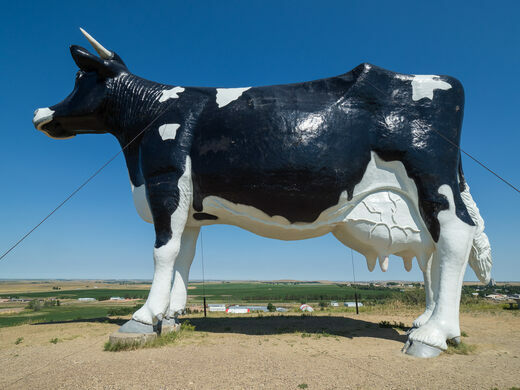 If, for some reason, appreciating Sue’s shapely body isn’t enough of a treat, visitors can also take the opportunity to enjoy a subtly marvelous view of North Dakota’s wide-open farmlands — farms stretching as far as the eye can see. Her presence shows that New Salem grows / With milk-producers’ yields; / We’ve got the cow, world’s largest cow / That looks across our fields. Take Exit 127 from Interstate 94, heading south for a few hundred feet. Follow the signs, including a right turn up a gravel road leading directly to Salem Sue. Mennes invented the tags we all place annually upon our license plates, and his story is told frankly and in full upon his headstone.